This easy microwave Peanut Butter Fudge Recipe has four ingredients and is prepped in about ten minutes. This foolproof fudge requires no candy thermometer and is delicious every single time. Wow the big day is just around the corner. Do you have your cookie trays ready to go? I have had so many requests for peanut butter fudge that I just decided to go ahead and make it and post it. I mean why not. It is such an easy recipe that it did not take me long at all. 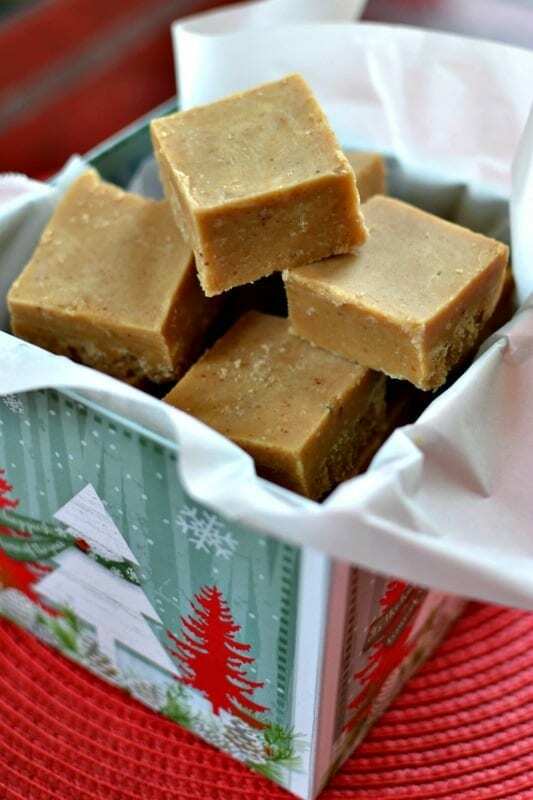 Peanut Butter Fudge Recipe can be whipped up in about five minutes and it sets up in about two hours covered in the fridge. Fudge does not get much easier than this folks. Do you love fudge but don’t want the hassle of finding your candy thermometer and stirring till you feel like you need an ice pack for your arm. Not to mention that if you don’t get that cooked fudge to just the right temperature for just the right amount of time you are not going to end up with the creamy result you are looking for. Instead you will end up with with grainy gritty pieces that you have to throw away or pawn off on the neighbors!! First line square pan with aluminum foil that hangs over the side and spray with nonstick baking spray. This will aid in removing the fudge from the pan and peeling the aluminum foil from the fudge. Take your time doing this as you want the corner pieces to go all the way to the edges. Microwave peanut butter and butter. Stir in vanilla and powdered sugar in three parts working quickly and stirring constantly. This fudge sets up fast so it needs your undivided attention. Finally spoon the fudge into your prepared pan and smooth the top with an offset spatula. Refrigerate for at least two hours. Use the aluminum foil to carefully lift the fudge out of the pan. Peel the aluminum foil from the back and cut into small squares. See how delicious it looks. I am a huge peanut butter fan so when it came down to whether or not to make this just days before Christmas it was a resounding yes. 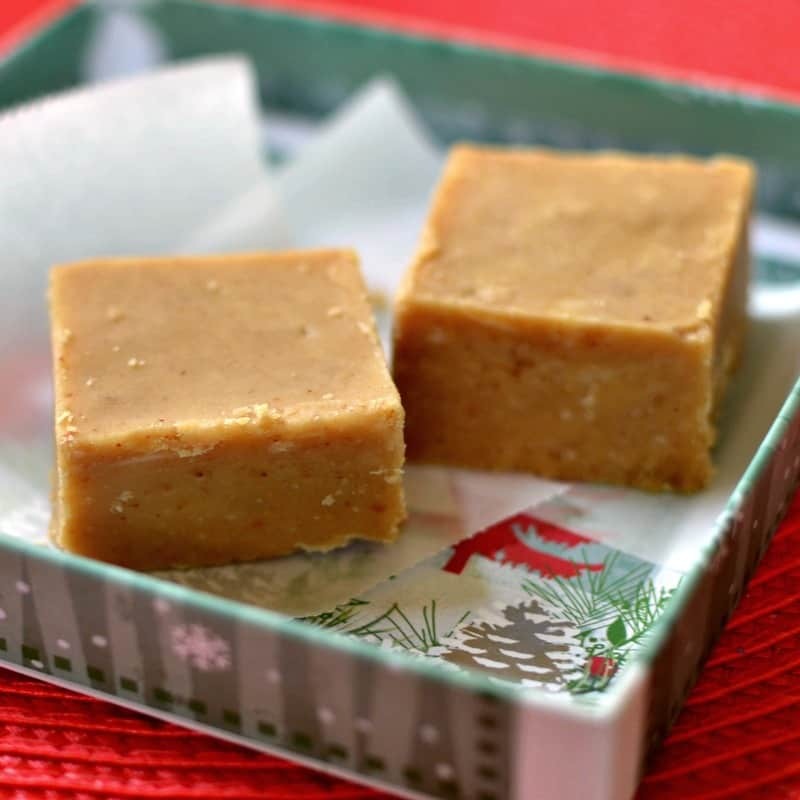 So if time is ticking and you still want a few treat for the neighbors or just in case someone stops by unexpected than this Peanut Butter Fudge Recipe is your baby. Store in an airtight container in your fridge for up to two to three weeks. Helpful hints on scoring and cutting fudge. Score your fudge with unflavored dental floss. It leaves clean even lines that are barely noticeable in case you make a mistake. Have a straight edge with measurements close by so you are making your pieces uniform size. Use a sharp thin knife that has been heated under hot water and dried well to cut the fudge. Aim for whatever size pieces you and your family like however if you are giving as gifts you want might want to cut in one inch pieces so you can get more out of a batch. 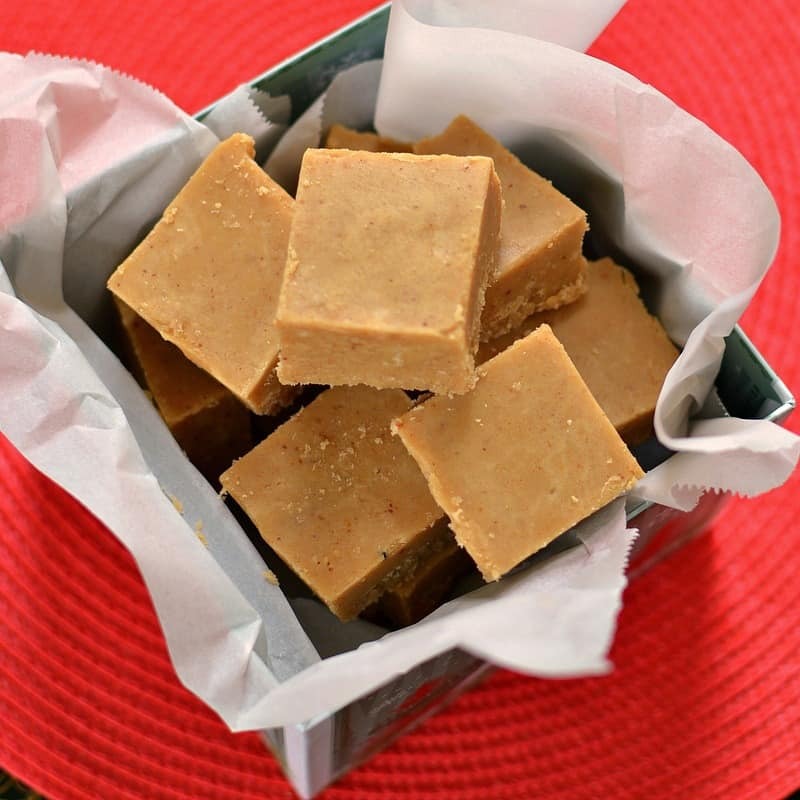 So if you like peanut butter as much as I do, you are short on time but still have a big heart than put this Peanut Butter Fudge Recipe on your to do list. You may even find that you have the ingredients already! This post was originally published December 19, 2017 and was republished October 19, 2018 with new content. 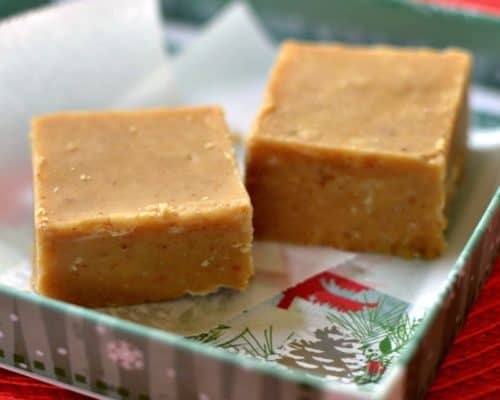 This foolproof delicious easy microwave Peanut Butter Fudge Recipe has four ingredients and is prepped in about ten minutes. Line 8 x 8 inch pan with aluminum foil sprayed lightly with nonstick baking spray. Leave an overhang on opposite sides. You will use this overhang to help remove the fudge from the pan. In large microwavable bowl add butter and peanut butter. Microwave on high for 2 minutes. Stir and microwave for 1 minute intervals stirring between each minute; until melted and smooth. Stir in vanilla. Stir in powdered sugar in about three parts; working quickly and stirring continuously. Spoon into pan and using a small offset spatula smooth the top of the fudge. Cover and refrigerate for at least two hours or until fully set. Using the overhang lift fudge out of pan and place on cutting board or plate. Peel off aluminum foil and cut into pieces. Use a thin sharp knife heated under hot running water to aid in the cutting of the fudge. 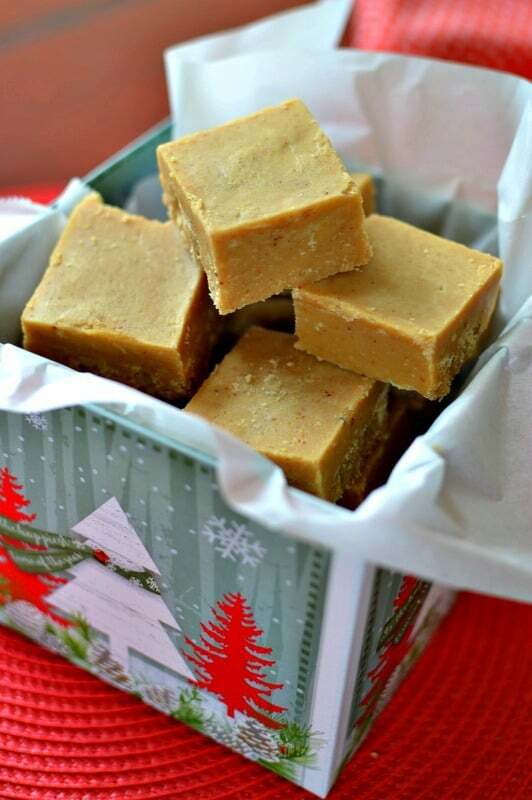 Your peanut butter fudge recipe makes me super excited for the holidays! That is awesome. I hope you enjoy it! After it’s cut, do I store in frig. or can I store on counter top in a glad container? You can store the candy at room temperature for a week or more in an airtight container. For longer storage, store it in the refrigerator or freezer for the best results. Pure peanut butter heaven! So rich and silky! Thanks so much Sommer. I am glad that you enjoyed it! This is such an easy and incredible recipe! Perfect for sharing. Thanks so much Karla! I am glad that you liked it! This is my most favorite fudge ever and it seriously couldn’t be any easier! Thanks so much Milisa! I am so glad that you like it!! This was super easy to make and it was a huge hit when we gave these in tins to our coworkers. I had to make extra for our family too. Awesome! I am so glad that you liked it. This is one of the BEST recipes, I love it! !